All-in-one flip book maker, an affordable page flipbook tool to convert PDF, OpenOffice, Images to realistic page flipping book with rich multimedia elements embedded in pages! Convert PDF, OpenOffice, Microsoft office, images to accessible and traceable flipbooks. Support batch convert PDF to flipbooks. Design and Branding - logo, company info, Background, tool bar, 3D flip effect, etc! Edit pages - Create 3D Objects and Embed image, flash, video, links, buttons, etc. Multiple Outputs for PC, tablets, mobiles - EXE, HTML (online use), ZIP, 3DP; publish for iPad, iPhone or Android devices; upload to FTP server directly. Social Integration - Share online flipbook worldwide. 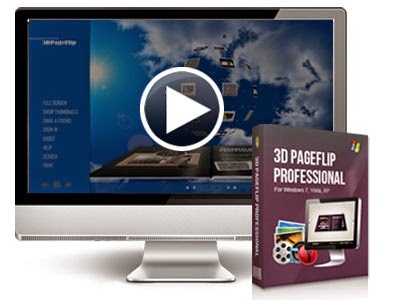 Upload online - Publish digital flip book on 3DPageFlip Server directly & Share Online. 0 Response to "3D PageFlip Professional"